Liverpool's Xherdan Shaqiri celebrates after propelling his team to victory against Man. United. 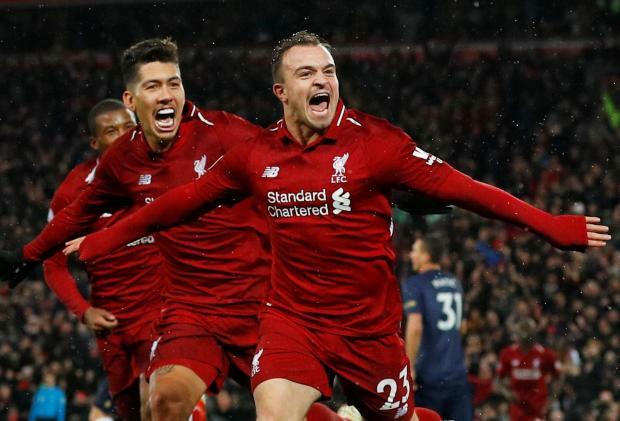 Two second-half goals from substitute Xherdan Shaqiri gave Liverpool a 3-1 Premier League win over Manchester United on Sunday as Juergen Klopp's side regained top spot with a pulsating performance in the North West derby. Liverpool roared out of the traps at Anfield and took the game to Jose Mourinho's side, grabbing the lead in the 24th minute when Sadio Mane chested down a pass from Fabinho and slotted past David De Gea. Against the run of play, United drew level in the 33rd minute when Liverpool keeper Alisson Becker spilled a harmless low cross from Romelu Lukaku and Jesse Lingard pounced on the loose ball to find the net. The hosts continued to dominate but it was not until the introduction of Swiss international Shaqiri that the game turned decisively in their favour. Mane's pull back from the byline took two deflections as it ricocheted to Shaqiri on the edge of the area and his shot flew off Ashley Young and into the top corner to make it 2-1 in the 73rd minute. Seven minutes later fortune was on Shaqiri's side again as another deflected shot, this time off Eric Bailly, beat the helpless De Gea. Unbeaten Liverpool have 45 points from 17 games with champions Manchester City, who beat Everton 3-1 on Saturday, a point behind.